Many real-world problems involve constraints that cannot be all satisfied. 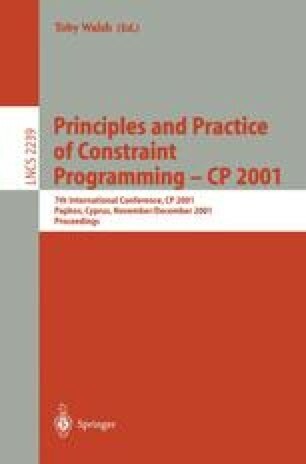 Solving an overconstrained problem then means to find solutions minimizing the number of constraints violated, which is an optimization problem. In this research, we study the behavior of the phase transitions and backbones of constraint optimization problems. We first investigate the relationship between the phase transitions of Boolean satis fiability, or precisely 3-SAT (a well-studied NP-complete decision problem), and the phase transitions of MAX 3-SAT (an NP-hard optimization problem). To bridge the gap between the easy-hard-easy phase transitions of 3-SAT and the easy-hard transitions of MAX 3-SAT, we analyze bounded 3-SAT, in which solutions of bounded quality, e.g., solutions with at most a constant number of constraints violated, are sufficient. We show that phase transitions are persistent in bounded 3-SAT and are similar to that of 3-SAT. We then study backbones of MAX 3-SAT, which are critically constrained variables that have fixed values in all optimal solutions. Our experimental results show that backbones of MAX 3-SAT emerge abruptly and experience sharp transitions from nonexistence when underconstrained to almost complete when overconstrained. More interestingly, the phase transitions of MAX 3-SAT backbones seem to concur with the phase transitions of satisfiability of 3-SAT. The backbone of MAX 3-SAT with size 0.5 approximately collocates with the 0.5 satisfiability of 3-SAT, and the backbone and satisfiability seems to follow a linear correlation near this 0.5-0.5 collocation. P. Codognet and F. Rossi. Notes for the ECAI2000 tutorial on Solving and Programming with Soft Constraints: Theory and Practice. Available at http://www.math.unipd.it/frossi/papers.html.